Kimchi Grill recently debuted a weekend brunch menu with breakfast tacos ($3 each) or burritos ($5.75) consisting of scrambled eggs with kimchi-chorizo home fries topped with pico de gallo, black beans and miso crema. 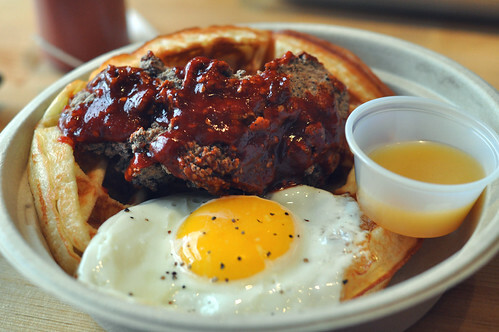 What really caught our eye was the organic mung bean waffle, spiced rice flour coated fried chicken (tossed with or without sweet & spicy glaze) served with organic blue agave nectar butter topped with fried egg ($8.50). The woman sitting at the table next to us also went the chicken and waffle route. And as we waited for our order we hear her give instructions to get the glaze on the side. Interesting choice, but I was confident in my order of chicken with the sauce-on. When I got the breakfast, I had to admit that she was right. Not because the sauce was too spicy or too sweet...on the contrary it was absolutely delicious. But coating of the chicken was just sooo good that you don't want to cover up any of the crispy, crunchy goodness until just before it hits your mouth. Trust me (or at least trust the lady next to me who knew better). The waffle is unlike your typical Belgian waffle--it was chewier, a little more glutinous tasting which I imagine was due to it being made with mung beans. It kind of reminded me of the Korean pancakes I like but in waffle form, so I was a fan, but if you're expecting a traditional waffle, you'll want to adjust your expectation so you can enjoy it for the fusion treat that it is. For $8.50 this is a generous (and tasty!) brunch and definitely one that I'd go back for again. Can't get enough Kimchi Grill (or Kimchi Taco Truck)? They're featured in our upcoming book New York à la Cart: Recipes and Stories from the Big Apple's Best Food Trucks along with their recipe for kim-cheesesteaks and Korean BBQ Nachos, both of which are RIDICULOUSLY delicious. The book releases on April 2nd, but you can pre-order it now from your favorite bookstore now!